With $5,000 awards to support separate creative projects, two students in the Sally McDonnell Barksdale Honors College at the University of Mississippi have been named 2018 Barksdale Award winners. 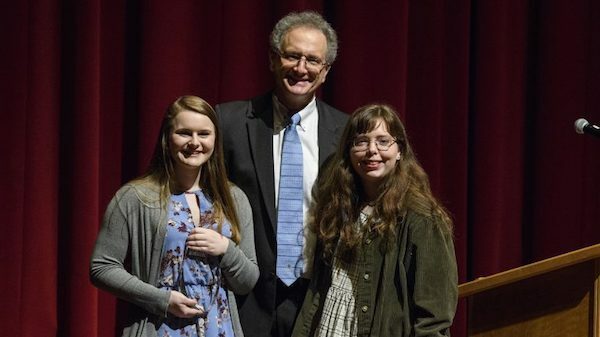 Bethany Fitts, a junior English and history major from Tupelo, and Gabrielle Schust, a junior international studies and Spanish major from Columbia, Missouri, were presented the awards during the Honors College’s annual spring convocation Tuesday (Feb. 20). The Barksdale Awards were established in 2005 to encourage students to test themselves in environments beyond the classroom, teaching lab or library. Fitts and Schust are the 23rd and 24th recipients of the honor. Fitts will spend time in Washington state and in Hawaii, gaining ground-level experience with several kindred topics: poetry publication, conservation and W.S. Merwin, two-time winner of the Pulitzer Prize for poetry and a founder of a conservancy housing more than 400 species of endangered palm trees. In Washington, with the well-respected Copper Canyon Press, she will gain hands-on experience with everything about poetry publication, from helping to organize community events to editing and marketing. At the Merwin Conservancy in Maui, Fitts will work in its education program and alongside the conservancy’s gardener. As a follow-up, she hopes to promote similar poetry/ecology work in all 50 states and to write her own collection of poems drawn from her experiences. Fitts serves as editorial assistant for the Ole Miss Alumni Review and as creative content editor for the undergraduate Populi Magazine. Last year, she won the English department’s Campbell Award. Fitts volunteers with Mississippi Votes and, last summer, was an intern with the Sunflower County Freedom Project, where she taught literacy, gardening and creative writing to students. Her questions have to do with the poet’s role in today’s chaotic society, and her own identity as a poet in that world and in Mississippi as it exists today. Fitts has worked with Daniel Stout, associate professor of British literature. Schust will travel to England to collect oral histories of older women in religious orders whose charitable works in the 1960s and early 1970s (pre-National Health Service) focused on medical care for the poor, especially for women or children. She has already contacted three such orders and arranged interviews with eight sisters, the eldest of whom is now 103. During an academic year in Lima, Peru, next year, Schust will conduct research into similar work being conducted in the Andes by women in religious orders. The statistics about poverty, maternal/fetal mortality rates and life expectancy in today’s Andes and England before the National Health Service are “striking,” Schust said. She hopes to determine how today’s efforts compare and provide an assessment for how the Andean practices might be improved upon. Schust has volunteered as an ACT Prep Class instructor and with the Oxford Film Festival, as well as for various local and national political campaigns. She is a member of Model UN and involved with UM’s Ghostlight Repertory Theatre and participates in youth and community theatre at home in Missouri. Schust spent a summer in Bolivia in the field school of Kate Centellas, Croft associate professor of sociology and anthropology. For more information about the Sally McDonnell Barksdale Honors College, visit http://honors.olemiss.edu/.